Downtown Miami from the flyover linking I-395 west with I-95 at the Midtown Interchange. Photo taken 03/04/14. Interstate 95 in Florida runs along the Atlantic coast, joining the various regions: the Gold Coast (Miami, Ft. Lauderdale, and West Palm Beach), the Treasure Coast (Port St. Lucie, Fort Pierce, and Vero Beach), the Space Coast (Melbourne, Cocoa Beach and Cape Canaveral) and the First Coast (St. Augustine and Jacksonville). The freeway totals 382.15 miles from a merge with U.S. 1 (Dixie Highway), south of Downtown Miami, to the St. Marys River into Georgia. Widening of 29.70 miles in Volusia County, from south of Florida 406 to north of Florida 44, is underway to summer 2016 as part of $118.37-million project. Further south in Brevard County, two additional projects expand Interstate 95: 12.44 miles from Indian River County north to Malabar Road, completed in spring 2014 at a cost of $51.76 million; 7.55 miles from Florida 528 (Beachline Expressway) north to a point south of Florida 406, completed in spring 2013 at a cost of $7.55-million. Source: Florida Department of Transportation District Five State Roadway Projects Website. PGA Boulevard to Donald Ross Road - all lanes open on December 23, 2011. Donald Ross Road to Indiantown Road - finished on February 24, 2012. A total of 25.3 miles of Interstate 95 in Florida is located in Broward County, which includes the metropolitan area for Fort Lauderdale. Interstate 95 was not the original limited-access freeway in Broward County, or Florida for that matter. Florida's Turnpike predated the earliest segments of Interstate 95 by two years, completed and opened in 1957. Construction on Interstate 95 began in 1959. By 1964, Interstate 95 was completed from the Dade County line to Florida 84. A section from Florida 84 to Davie Blvd was completed in 1968. North of there, construction began on remaining segments between 1969 and 1972. All of Interstate 95 in Broward County was completed and opened to traffic in 1977. Most segments were constructed with six lanes originally. During the 1980s, congestion on Interstate 95 became severe, with more and more people commuting between Dade and Broward counties. Florida received generous Interstate funding in the early to mid-1980s, a portion of that went to expanding Interstate 95. Part of the design plans were to add extra lanes on Interstate 95, including one High Occupancy Vehicle (HOV) lane in each direction that would continuously stretch from Interstate 195/Florida 112 in Miami north to Linton Boulevard in southern Palm Beach County. There would also be major interchange upgrades at the newly constructed Interstate 595, Florida 84, and Davie Boulevard. Sound barriers would be built in some places where it was deemed necessary to mitigate noise impacts. Construction began in 1988, and soon construction would be along the entire length of Interstate 95 in Broward County. To lessen the construction impacts on traffic, Tri-Rail was implemented. Tri-Rail, a rail system named for three counties which it would service (Dade, Broward, Palm Beach) was to run using the existing railroad tracks parallel to Interstate 95. Service started in 1989 and was originally intended to stop once the tri-county Interstate 95 expansion ended, but it continues today. To improve service, the Double Track Corridor Improvement Program, completed in 2007, added a second mainline track parallel to the existing track. The Interstates 95 and 595 interchange was fully opened on March 22, 1991, after three years of construction and $121 million. Today, Interstate 95 in Broward is a wide 10 and 12 lane road, with an eight-lane section from Deerfield Beach to Boca Raton in Palm Beach County. There are massive interchanges at Interstate 595, Florida 84, and Davie Blvd, which are on multi-levels and involve collector distributor roads. Other than that, your typical Interstate 95 interchange in Broward is a diamond or partial cloverleaf. One interesting feature is the Commercial Blvd (Florida 870) interchange, which features a flyover ramp from westbound Commercial Boulevard to southbound Interstate 95. The Broward section of Interstate 95 is the heaviest traveled section in all of South Florida and the entire state. 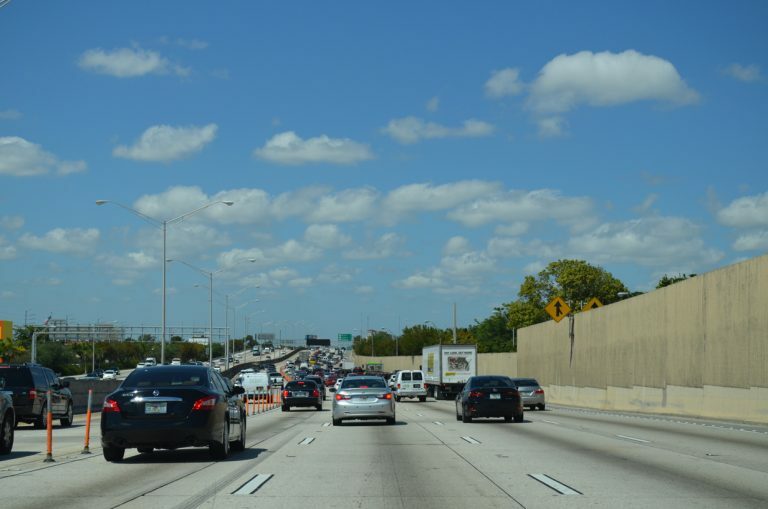 Traffic volumes in Broward generally exceed well over 200,000 vehicles daily, and from Interstate 595 to Sunrise Blvd SR 838), 2013 traffic volumes topped out at 328,000 vehicles per day. This puts I-95 traffic volumes at levels comparable to California 91 (Riverside Freeway) in Orange County, one of the busiest routes in Southern California. 95 Express Phase 2 extends the High Occupancy Toll (HOT) lanes north from Miami-Dade County and the Golden Glades Interchange. The project converts the existing HOV lanes into two express lanes in each direction. $112-million in work commencing in November 2011 runs through spring 2015. Upon completion, the 95 Express Lanes will run from Interstate 195 in Miami to Broward Boulevard (SR 842 / Exit 27). Construction of Phase 3 of the 95 Express Lanes will extend the toll lanes another 29 miles north from Stirling Road (SR 848 / Exit 22) in Broward to Linton Boulevard (Exit 51) in Palm Beach County. Split into separate sections, Phases 3A/3B run between Broward Boulevard and SW 10th Street with construction beginning in early 2016. This work coincides with the implementation of ramp metering from Hallandale Beach Boulevard (Exit 18) to SW 10th Street in Fort Lauderdale. The southernmost portion of Interstate 95 runs 17.1 mile in Miami-Dade County. While the state legislature named Interstate 95 the "William B. Singer Expressway," it is not the popular name for the freeway, with locals instead opting to call the freeway Interstate 95, I-95, or the even shorter nickname "the I." Interstate 95 is the most important freeway in South Florida and served as the catalyst for growth and economic opportunity that made this region successful. Florida's Turnpike, opened in 1958, was the first limited access route in Dade County. It was followed by construction that same year on the Palmetto Bypass, which was completed in 1962 and is better known today as the Palmetto Expressway (Florida 826). It was not until 1959 that construction commenced on I-95, which entailed building the freeway from NW 31st Street to NW 95th Street. Work also coincided with construction on Interstate 195, the Airport Expressway (Florida 112), and their respective interchange. That segment was completed and opened in December, 1961. The next segment to start construction was north from the first completed segment ending at NW 95th Street into Broward County to Florida 84 in Fort Lauderdale. Construction of this segment also encompassed the construction of the massive Golden Glades Interchange. In 1964, this segment along with the high powered interchange was completed. It was also during this time that the path through downtown Miami was finalized, including two new spur routes: Interstate 395 and Florida 970, the downtown distributor. Added to this mix would be the East-West (now Dolphin) Expressway, which would be a continuation of Interstate 395 west of Interstate 95. Next work began on the section from the planned southern terminus of I-95 at U.S. 1 north to Flagler Street. The already completed segment that ended at NW 31st Street was extended southward to NW 20th Street. This segment was completed and opened by 1968. By this time, the route of Interstate 95 through Dade County was nearly complete except for a gap in downtown Miami between Flagler Street and NW 20th Street. This section started construction in 1968, and the planned Interstate 395, Florida 970, and Florida 836 (Dolphin Expressway) were built in concurrence with it. This segment finally opened in late 1969. The final construction project slated for Interstate 95 was the new interchange with Ives Dairy Road, which started in 1969. All of Interstate 95 in Dade County was constructed with six lanes, except for an eight-lane section downtown, and a brief four-lane segment from SW 25th Road to U.S. 1. The freeway was built utilizing concrete from U.S. 1 north to the Golden Glades Interchange. Once at the Golden Glades Interchange, the surface changed to asphalt. In 1969 when the Dade County transportation plan was released, in addition to the maze of expressways that were planned to cross the county, there were proposed upgrades to Interstate 95. The plan proposed the widening of all of Interstate 95 to eight lanes, except for a brief segment from NW 135th Street to the Golden Glades Interchange, which was to remain unchanged. 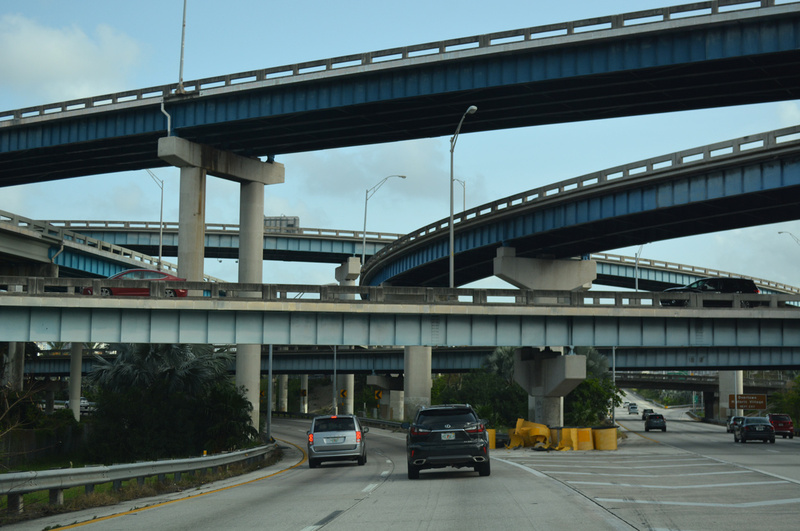 While several of the expressways from the original, controversial Miami freeway plan were killed, Florida DOT decided that Interstate 95 should be upgraded. With the population of Dade and Broward County booming, it would eventually have to be widened. However, these upgrades would not happen until much later. The 1970s became the 1980s, and nothing was done to Interstate 95, which was still in its original condition. In 1976, the NW 54th Street exit ramps were closed due to their proximity to the NW 62nd Street exit to the north. In early 1983, street lights were placed along a section of Interstate 95 in North Miami-Dade County that was previously unlit, due to complaints by residents of North Miami Beach. Eventually, Interstate 95 was lighted continuously from U.S. 1 to northern Palm Beach County. During this time, Miami gained a lot bad press for its criminal and drug activity, and Interstate 95 was no exception. Stories of snipers hiding on overpasses shooting cars below and teens throwing rocks at oncoming cars were a frequent occurrence. At the same time, many street lights along Interstate 95 started burning out, making stopped cars vulnerable to attacks from people who wandered onto the Interstate. With that, FDOT started to construct high chain link fences with barbed wire along Interstate 95, mostly along its path through Liberty City, one of the more crime-ridden areas of Miami. As the 1980s continued, it became clearer that Interstate 95 would have to be upgraded soon. Planning had begun in the mid-1970s for widening of Interstate 95 from Florida 112 (Airport Expressway) north through Broward County to Linton Boulevard in southern Palm Beach County, a distance of 47 miles. The only thing that prevented this from happening sooner was funding, which had postponed this major reconstruction project for nearly 11 years. It was also clear that the original freeway from 1969 was inadequate to handle present traffic volumes and project counts. Thus, the Interstate 95 upgrade would be a large project broken up in many segments. 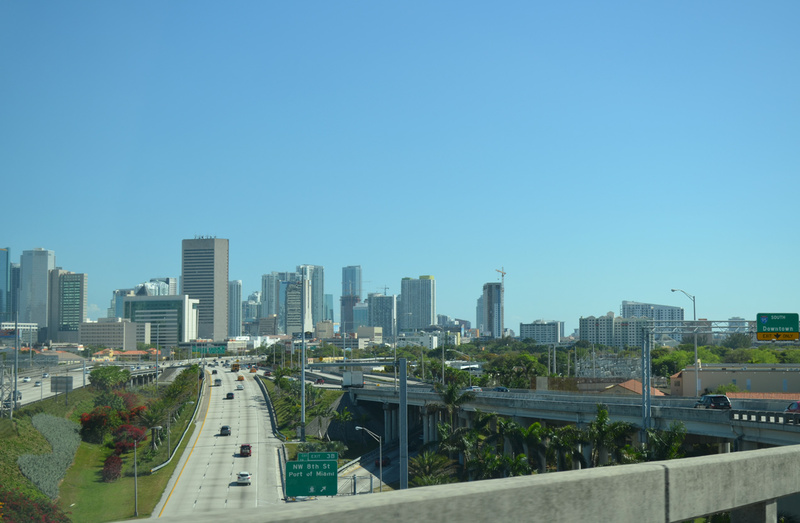 The planned upgrades in Dade County were widening from six lanes to ten and twelve lanes from the Golden Glades Interchange to the Airport Expressway. From the Golden Glades Interchange to the Broward County line, it would be widened to eight lanes (ten lanes from Ives Dairy Road to the county line). In addition, one of the new lanes constructed in each direction would be a high-occupancy vehicle (HOV) lane, restricted to buses and carpools of three or more people. This was later changed to two people. The ultimate cost for the entire project was $400 million, which was nearly one-third of the amount it cost to construct all of Interstate 595 in Broward County at the same time. The first section of Interstate 95 to be upgraded was from the Golden Glades Interchange north to the Broward County line. One high occupancy vehicle lane was constructed in each direction in the median, and one lane was constructed outside from Ives Dairy Road to the county line. Work started the first week of November 1986 and was completed in mid-December 1988, at the cost of $15.8 million. August 1988 saw the opening of a frontage road connecting NW 62nd Street to 54th Street. This road was built to give Interstate 95 motorists access to 54th Street (via the 62nd Street exit) that they had not had upon the closing of the 54th Street ramps in 1976. Business owners along NW 54th Street also pushed for this road, complaining that lack of access hurt their businesses. The next segment of reconstructed Interstate 95 involved constructing HOV flyover ramps to the Airport Expressway. 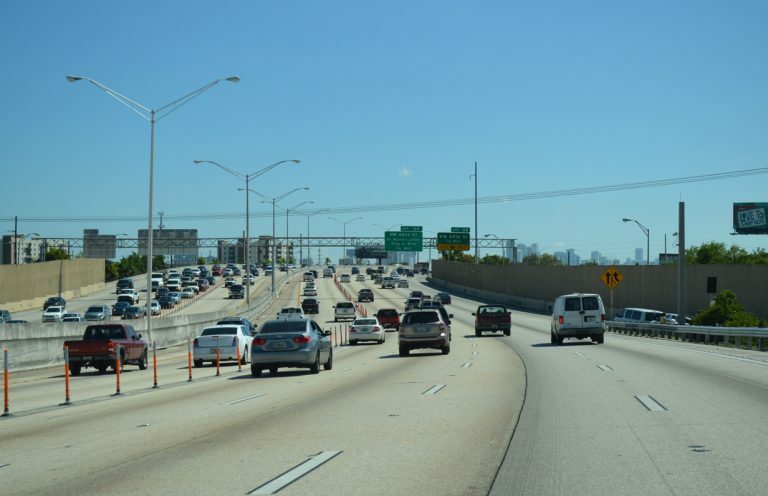 Depending on which direction you were traveling, the high occupancy vehicle (HOV) lanes on Interstate 95 would end (or begin) and would soar over the westbound Airport Expressway. Construction started in October 1987 and ended in December 1990. Additional segments of Interstate 95 between the Airport Expressway and the Golden Glades Interchange began construction, with the last section of widening occurring between NW 129th and 151st Street. Construction began in May 1992 and ended February 1995. Part of this project also entailed a pair of one-mile long, 94-foot high flyover ramps which would carry the Interstate 95 HOV lanes above the Golden Glades Interchange, therefore missing it entirely. These ramps opened on January 11, 1995, to mixed reviews and $40 million. Some felt that much money had been wasted on ramps that would be utilized by few, and others felt that they were ugly. At any rate, they drastically changed the look of the Golden Glades Interchange, and were visible from miles away peeking through residential neighborhoods. The HOV lanes were only in effect from 7:00 a.m. to 9:00 a.m., Monday through Friday. With the flyovers and remaining projects completed by mid-July, thus marked the end of an eight-year long ordeal of continuous construction from Miami to southern Palm Beach County. It was undoubtedly one of the most complex, expensive, yet impressive road construction projects in Florida and the nation, perhaps more so than Interstate 595. Now it would be the time to reap the results of a wider Interstate 95 and the benefits it would bring. In August 1999, a seven-month project began to grate and smooth the surface of Interstate 95, which had no doubt been disrupted by the construction projects five to ten years prior. The grating of the road was to provide increased traction when the road becomes slick with rain. From 2001-2002, sound walls were constructed along most of Interstate 95 from the Golden Glades Interchange to SR 112. Prior to this, the only section in Dade County that had sound walls was the segment between the Golden Glades Interchange and Ives Dairy Road. Many segments of Interstate 95 in Broward and Palm Beach County had sound walls installed during the widening in the late 1980s, but somehow Dade was left out. The sound walls have a "Florida" theme, graced with imprints of birds and painted a sand color. Heavy traffic at the onset of the evening peak hours along Interstate 95 north between Exits 8A and 9 near Miami Shores. Photo taken April 1, 2014. Plastic pylons separate the managed lanes from the general travel lanes and tolls are collected electronically, primarily through Sunpass transponders. Vehicles meeting the three passenger requirements can use the Express lanes free of charge, but must be registered. All other users of the Express lanes pay variable toll rates depending upon time of day and traffic congestion. Interstate 95 winds southward through north Miami with 12 overall lanes (four HOT lanes and eight general travel lanes). Photo taken March 3, 2014. Phase 2 of the 95 Express Lanes extended the HOT lanes northward from the Golden Glades Interchange into Broward County. This included modifications to the Ives Dairy Road interchange (Exit 16) at North Miami Beach. Work ran through April 2015. The retired South Florida Roads web site (southfloridaroads.com by Jason Learned) provided useful information on Florida's east coast interstate. Much of the information provided here was originally posted on TropicalTurnpikes.com and was reproduced with permission by Justin Cozart. St. Lucie Boulevard east at Interstate 95. Photo taken 10/18/14. Separate ramps connect St. Lucie Boulevard westbound with I-95 north to Vero Beach and Melbourne and south to Jupiter and West Palm Beach. Photos taken 10/18/14. Leading east from Interstate 95 (Exit 289), Palm Coast Parkway approaches the intersection with Old Kings Road North. 19 miles of Old Kings Road, which parallels I-95 through Palm Coast, doubles as the Heritage Crossroads Florida Scenic Highway system. Photo taken 07/23/13. Interstate 95 trailblazer posted along Palm Coast Parkway west after Florida Park Drive. This stretch of the parkway partitions with roadways separated by businesses. All area traffic lights are enforced with photocops. Photo taken 07/23/13. The northbound on-ramp to I-95 leaves Palm Coast Parkway west after its intersection with Old Kings Road North. The on-ramp is devoid of a guide sign for Jacksonville. Photo taken 07/23/13. Old St. Augustine Road westbound at Interstate 95 between Flagler Center and Batram Park in south Jacksonville. Photo taken 06/16/16. I-95 trailblazer posted at the exit of a hotel on Salisbury Road at Southside Jacksonville. The shield was installed in March 1995 and replaced by 2013. Photo taken 03/14/10. The Fuller Warren Bridge carries Interstate 95 over the St. Johns River between Exits 350B (San Marco Boulevard) and 351A (Park Street) near Downtown Jacksonville. Photo taken 08/23/04. The concrete bases that supported the bascule section of the previous Interstate 95 bridge across the St. Johns River were removed by 2007. Photo taken 08/23/04. San Marco Boulevard links SR 13 and the Acosta Bridge with Interstate 95 north across the Fuller Warren Bridge via Gary Street west. Photo taken 06/13/08. High rises in Downtown Jacksonville rise beyond the Acosta Expressway in this scene along Palm Avenue north at Gary Street below the I-95 approach to the Fuller Warren Bridge. Photo taken 07/22/04. View the Jacksonville skyline and the Acosta Bridge (Florida 13) across the St. Johns River from Gary Street west at Palm Avenue adjacent to I-95. Photo taken 06/13/08. Florida 114 (8th Street) west at the northbound on-ramp to Interstate 95 in the Springfield community of Jacksonville. Photo taken 03/03/13. "The never-ending I-95 construction Roadwork zones threaten to outlast drivers." The Florida Times-Union, August 23, 2003. "I-95 CARPOOL LANE OPENING IN SOUTH COUNTY." Palm Beach Post, September 20, 2004. "I-95 WIDENING STARTS IN BUSY WEST PALM SECTION." Palm Beach Post, January 4, 2005. "AFTER 7 YEARS OF I-95 WORK, WE'RE NEAR END OF THE ROAD." Palm Beach Post, November 2, 2009. "Wider I-95 with HOV lane ready." Palm Beach Post, December 22, 2011. "Work on I-95 south in Jupiter wraps up." Palm Beach Post, February 24, 2012. "Miami FL/I-95 southbound express lanes to toll from Jan 15, year-old NB lanes success." TollRoadNews, January 8, 2010.